breaking Columbia concrete early Saturday? You know, that one? That thing over in D.C., right? You remember, that 3rd one that got them that 3rd one? Well, if you weren’t aware, the Storm were real troopers, clenching the first three of the WNBA Best-of-5 finals games — to win Seattle Storm’s 3rd WNBA Championship! How does one celebrate such a feat by such feet?! With your own feet, of course! Closure of Harrison St roundabout west of 5th Ave N.
Parking restrictions on Broad St (near 5th Ave) taxi cut out, and on W side of 1st Ave N, between Thomas/Republican. Beginning of rally inside Key Arena! Need another reason to celebrate? SB SR 99 reopens Sunday at 11:59 PM! It’s worth a reminder that SB SR 99 closes at 11:59 PM tonight (calibrate your watches), from the S end of Battery St Tunnel to S Spokane St. Sorry to end on a downer. For more information on travel impacts, check out our construction look-ahead and traveler’s map links. 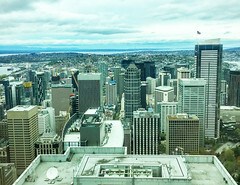 If you have advisory/events questions, email us at construction.coordination@seattle.gov or call 206-684-ROAD (7623). There’s only ONE game this week if they win again tonight! Let us just take this moment to honor them…. Seattle Mariners host San Diego Padres at Safeco Field, for a second time this week; 3:40 PM start. Boats Afloat Show at Chandlers Cove in South Lake Union, 901 Fairview Ave N; 11 AM – 6 PM. Virtual Self – Utopia Tour concert at WaMu Theater; 7 PM – 11:45 PM. The Susan G. Komen Seattle 3-Day, Opening ceremony at Seattle Center North Fountain Lawn; 7 AM (walkers arrive 5:30-6:30 AM). Note: public parking will NOT be available in Memorial Stadium Parking Lot. Visit Seattle Center’s parking page for more info. Seattle Greek Festival at St. Demetrois Greek Orthodox Church, in Seattle’s Montlake neighborhood; 12 PM – 9 PM. Leon Bridges: Good Thing Tour concert at WaMu Theater; 8 PM – 11 PM. **Revive I-5 weekend | NB I-5 reduced to 2 lanes, Martin Luther King Jr. Way to Olive Way; 8 PM Fri. – 5 AM Mon. See more details below. POSTPONED due to weather! **SB SR 99 will be closed, S end of Battery St Tunnel – S Spokane St; 11:59 PM Fri. – 11:59 PM Sun. Seattle Fiestas Patrias, Annual festival and parade in Seattle’s South park neighborhood to commemorate the independence of Latin American countries; parade 10 AM – 1 PM then festival 1 PM – 6 PM. Seattle Greek Festival at St. Demetrois Greek Orthodox Church, in Seattle’s Montlake neighborhood; 10 AM – 9 PM. Battery Block Party event, closing Battery St between 1st and 2nd avenues; 10 AM – 8 PM. Boats Afloat Show at Chandlers Cove in South Lake Union, 901 Fairview Ave N; 10 AM – 6 PM. The Susan G. Komen Seattle 3-Day, spectator/route information here (starts/ends at Seattle Center). **Mercer St will be closed for repaving, between Eastlake Ave E and Yale Ave N, and parking restricted; 7 AM – 5 PM Local access only with up to 15-minute waits to clear equipment, along Yale Ave N between Republican St and Mercer St and Mercer St between Pontius Ave N and Yale Ave N.
Seattle Greek Festival at St. Demetrois Greek Orthodox Church, in Seattle’s Montlake neighborhood; 12 PM – 7 PM. The Susan G. Komen Seattle 3-Day, spectator/route information here; closing ceremony at Seattle Center’s Memorial Stadium; 4:30 PM. Note: public parking will NOT be available in Memorial Stadium Parking Lot. 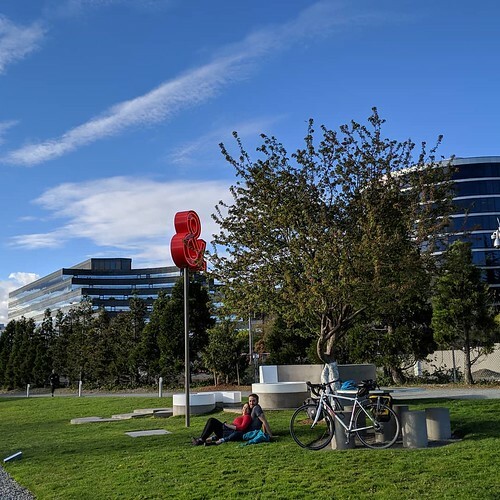 Visit Seattle Center’s parking page for more info. Revive I-5 weekend | details POSTPONED due to weather! West Seattle Bridge on-ramp closed 10 PM Wed. – 4:30 AM Thurs. Off-ramp to Columbian Way closed 9 PM to 5 AM nightly, Wed. – Fri. (morning). Note: work is weather dependent. Columbia St remains closed | between 1st Ave and Post Ave. This will continue through the end of the month, to complete an areaway project. Columbia St still reduced 1 lane | between 1st Ave and 3rd Ave. The work is set to wrap by early next week, or sooner. Blanchard St remains closed | between 7th and 8th, through Friday, for simultaneous construction of 4 projects. The 3 week full closure replaced a 3-4 month partial closure. Fir St will be closed Saturday | between 9th Ave and Broadway, during tower crane removal. Sept. 19 | Seattle Sounders vs. Philadelphia Union at CenturyLink Field; 7:30 – 9:30 PM. Sept. 20 – 23 | Seattle/King County Clinic in KeyArena at Seattle Center; An annual volunteer-driven free clinic for people in need. Sept. 21 | PARK(ing) day! Enjoy approximately 40 locations throughout the city. Sept. 21 – 22 | The Great Wallingford Wurst Festival at Saint Benedict Catholic Church in the Wallingford neighborhood. Sept. 21 – 23 | Fremont Oktoberfest benefit for the Fremont Chamber of Commerce. Sept. 21 – 22 | Wall St closed between 6th Ave and Denny, and buses rerouted, for 600 Wall St development to erect a tower crane. Sept. 21 – 24 | SR 99 full closure, both directions, S end of Battery Street Tunnel to S Spokane St; hours TBD. Sept. 22 | 6th Ave closed between Seneca and University, for a mast arm installation. Sept. 22 | UW Huskies vs. Arizona State At Husky Stadium (& UW Band Day! ); Go Dawgs! Union St, 4th to 6th avenues. Sept. 22 – 23 | Boren Ave, Howell St to Olive Way reduced to 1 lane for utility work; 24/7. 9th Ave N closed, Mercer to Republican streets. Republican St closed, 9th to Boren avenues N.
Thomas St closed, 9th to Fairview avenues N.
Sept. 23 | Seattle Seahawks vs. Dallas Cowboys At CenturyLink Field; 1:25 – 4:30 PM. Sept. 23 | Orca Half Marathon along the shores of West Seattle, Lincoln Park to Don Armeni Boat Launch. Sept. 23 | Art Marble 21 Block Party, closes Westlake Ave N between Roy St and 9th Ave N.
The reality of a 3-week SR 99 closure is on the horizon. No confirmation yet on when – but be prepared! ID/Chinatown Downtown Transit Tunnel. Image by J. Clark. We’re getting ready for the Maximum Constraint. Starting January 11, 2019, As early as this fall the Washington State Department of Transportation (WSDOT) will move forward with the permanent closure of the Alaskan Way Viaduct. This construction project is one of countless private and public construction projects taking place in the right of way in and around downtown. THE PERIOD OF MAXIMUM CONSTRAINT. And while it sounds like it could be the name of a summer action blockbuster starring Will Smith, it’s not quite that dramatic, but a big deal nonetheless. During this period, folks who travel in and around downtown will be impacted by increased construction, which will lead to more congestion with additional street closures and ongoing delays. Yes, ironically, things will get tougher before they get better. Alaskan Way Viaduct as it looks today. Image by J. Clark. Seattle is entering a new era of tough traffic and we continue to work with our partner agencies, businesses, commuters, and community members to prepare. Together with our partnering agencies, we’re working to reduce congestion during this challenging period and limit the impact on commuters and businesses. Throwback movie clip from 2011 AWV demolition via SDOT Flickr. The impending demolition of WSDOT’s 1950s vintage Alaskan Way Viaduct and the opening of the new SR 99 Tunnel will forever change the Seattle transportation landscape. 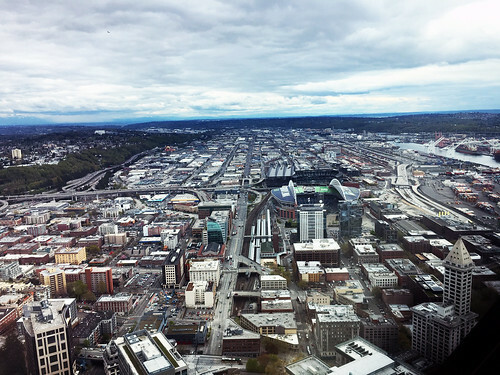 In addition, there are more than more than 60 construction cranes currently dotting the skyline for megaprojects like the expansion of the Washington State Convention Center. And work is expected to intensify over the coming months. Pioneer Square Transit Station. Image by J. Clark. We’re working to ensure these travel woes are not detrimental to your commute, especially those who rely on transit. We’re working closely with local and regional transit partners, like King County Metro, Sound Transit, the Washington State Department of Transportation (WSDOT) and the Downtown Seattle Association (just to name a few) on ways to help you get around downtown as safely and efficiently as possible during this transition. Added more public transit service on our busiest bus routes to help you avoid sitting in your car in traffic, and in a moving vehicle with priority service. 3rd Ave transit priority is already in place to increase public transit flow and consistent travel time reliability. New signal timing on 2nd and 4th Avenue downtown to improve transit speed and reduce conflicts between turning vehicles, pedestrians, and buses. Distributed ORCA Opportunity cards to all Seattle high school students. Adding more traffic cameras and travel time detectors so we’ll have more real-time data about how traffic is moving. A new regional transportation digital platform that gives real-time traffic and construction updates as well as weekly traffic forecast reports for the work week. Pilot load zone projects for urban goods delivery by e-cargo bike and rideshare priority areas for Lyft and Uber. We’ll test out new strategies to see how they work before expanding them to other parts of downtown. Outreach to businesses working on major projects to reduce construction impacts on our busiest downtown streets during our busiest times. New 24/7 real-time traffic monitoring at SDOT’s Transportation Operations Center and social media updates to help you time your commute. Off-board fare payment and all-door boarding on 3rd Avenue for all bus riders – not just those on the RapidRide routes. This will help to speed up travel times for the over 100,000 people who ride a bus on 3rd Avenue every weekday. 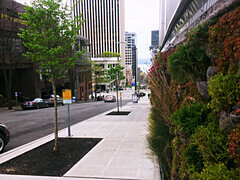 A new pathway for northbound buses on 5th and 6th Avenues to maintain transit travel times through downtown once the Downtown Seattle Transit Tunnel becomes light-rail only in Spring 2019. 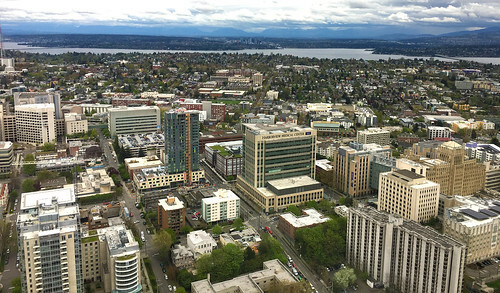 Sound Transit is on track to open extensions to Seattle’s University District, Roosevelt and Northgate neighborhoods in 2021, with service to Mercer Island, Bellevue and Redmond’s Overlake area opening in 2023. Additional extensions to Kent/Des Moines, Federal Way, Shoreline, Mountlake Terrace, Lynnwood, and Downtown Redmond will open in 2024. 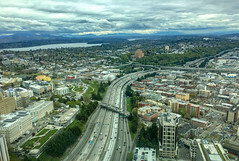 Thereafter, light rail extensions are scheduled to reach Tacoma and West Seattle in 2030; Ballard in 2035; Everett in 2036; and South Kirkland and Issaquah in 2041. Timeline of downtown major construction impacts. Summer of 2018 | WSCC has launched a transformative project that will provide economic and public benefits, including affordable housing, cycling, and pedestrian improvements, and a study of lidding more of I-5 – as part of its $92 million expansion. Construction is expected to be complete in 2021. Currently in Construction | At the corner of 5th Ave and Union St, Rainier Tower 2 is a new building being built in Rainier Square and will become an iconic new skyscraper on Seattle’s horizon. It will house a new space for offices, retail stores, a hotel, residential units, and parking. Construction is set to continue into 2021. January 11, 2019 | WSDOT will close SR 99 through downtown Seattle for approximately three weeks to build roadway and ramp connections, realign SR 99 and open the new SR 99 tunnel. Early 2019 | The new 2-mile stretch of SR 99 tunnel opens to traffic. 2019 | After the tunnel opens, AWV demolition begins by the waterfront, the tunnel will be decommissioned, and Aurora Ave N connected. 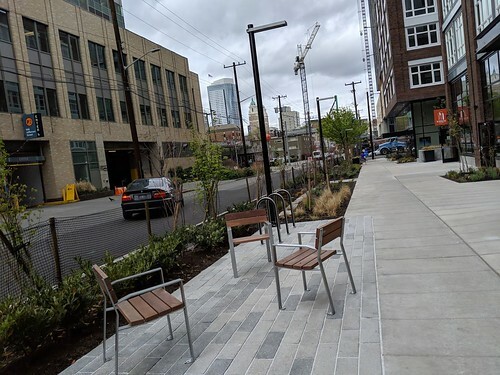 2019 | Built by the City of Seattle’s Office of the Waterfront, the new Alaskan Way street will be transformed along the waterfront. Spring 2019 | King County Metro bus routes 41, 74, 101, 102, 150, 255 and Sound Transit Express Route 550 buses will no longer use the transit tunnel and will operate on surface streets. 2019 | The SR 99 tunnel will be free to use when it opens for a period of time before tolling starts. Pioneer Square Light Rail, Downtown Seattle Transit Tunnel. Image by J. Clark. From the anticipated grandeur of a Pike-Pine Renaissance to breathtaking views from a reinvigorated Seattle waterfront, people will be connected to and through a re-imagined downtown. This is just a sample of projects and information. And now that we have it, it’s crucial that you can start thinking about how these impacts may affect you. Seattle💙. Image by J. Clark. We’re in this together. In the coming weeks, we’ll make some additional announcements that will help you plan and prepare for future travel to help you navigate during this period, including to be among the first to sign up for downtown traffic reports, news and information. Together, along with our local and regional partners will help you successfully navigate this period to make daily connections that keep you moving. Waves of art installed 16 years ago under the Alaskan Way Viaduct, are washing away…to storage. On August 30 of 2002, the Seattle Post-Intelligencer ran the story, ‘Wave Rave Cave’ is artwork by day, club-scape by night, with a photo of carpenter Michael Graham working on the installation. With the near future Alaskan Way Viaduct (AWV) closure and demolition, the sculptures, at the corner of Western Ave and Bell St, are relocating for safe keeping. Wave Rave Cave by Dan Corson | Photo courtesy of Seattle Office of Arts & Culture. Travel to new temporary home. The Seattle Office of Arts & Culture notes, a new site for the artwork has yet to be determined–so it’s safe storage for now. To preserve the waves creation, crews will carefully remove the pieces, then drive them to the City’s Nickerson Place North storage area, near the Fremont Cut. Look for traffic control (TC) signs and a flagger along W Nickerson St, near 13th Ave W, and intermittent traffic slowdowns with deliveries. For the relocation, the Bridges and Roadway Structures team needs room to maneuver a forklift to a loading truck and trailer, impacting sidewalks at both pick-up and delivery and the bike lane along Western. Be ready to make way for art, as it heads north in several waves (pun intended)! Bike lane on Western Ave, at Bell St: intermittent; hour-long. East Sidewalk on Western Ave, under AWV SB: intermittent; hour-long. – Signs will direct people to a marked crosswalk on Western Ave.
– A side walk spotter will guide passersby to a safe distance from the work. No parking on Western Ave, between Battery and Bell streets. Thank you for your patience as this artwork tide comes in! APP DEADLINE EXTENDED | Apply for your Pop-up Park! Yes, that’s PARK and PARTY’s Hollywood couple name. This September 21, we’re bringing PARK(ing) Day back to parking spots near you! Get this annual global placemaking event on your calendars when communities unite and ignite imagination and expression. It’s the one day a year when you can transform an on-street parking space into a temporary, mini pop-up park. You should apply! We’ve extended the deadline to Aug. 26! Inspired? Got an idea? Great! You should apply. Anyone can apply! If you have an idea on how to create a community space, this is for you! We’re accepting applications through August 24 Sunday, August 26! It’s easier than ever to participate by opting-in to one of six neighborhood clusters. Clusters are multiple installations grouped together to make for a safer, less isolated, and a more engaging PARK(ing) Day experience. Not to mention, we’ll take care of the logistics for you (you’re welcome). Learn more about neighborhood clusters on our website and guidelines. We want to celebrate everyone’s placemaking efforts with an awards ceremony! 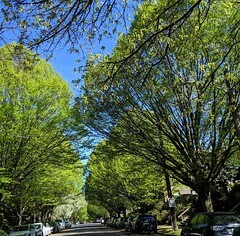 Held as the culminating event to the Seattle Design Festival, all participants will be eligible to win one of three awards presented by WASLA Washington Chapter of American Society of Landscape Architects. Plan to join us for the awards celebration at the Center for Architecture and Design on Friday, September 21, from 7 – 9 PM. 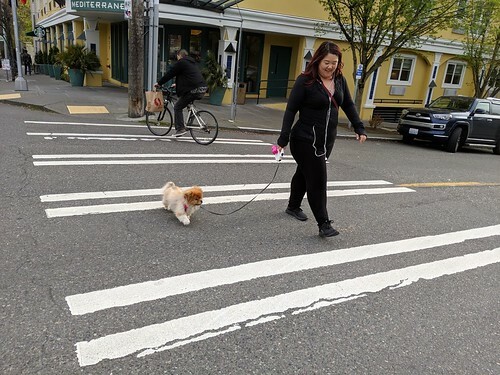 We encourage communities to use streets as sites for public expression and creative experimentation, as well as for the enjoyment of health and wellness. We hope to see you help reimagine our streets with us on September 21. If you have questions or want to learn more about what’s new, come to one of our info sessions! Did you miss the July 31 info-sesh? Lucky for you, we have two more! Visit our website for details, how to apply, or to contact a member of our team. 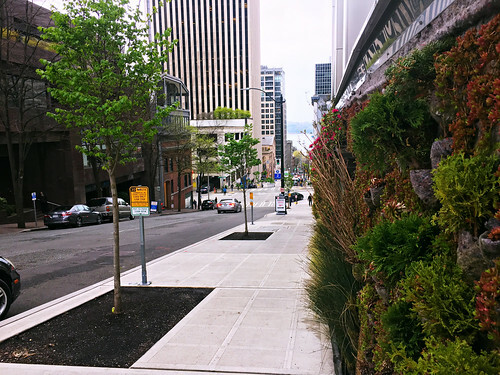 Have you found the NEW dedicated car share spaces along Montlake Boulevard NE, near UW? Waldo has! We recently installed them along SB Montlake, just north of the Hec Edmundson Pedestrian Bridge, to enhance mobility options. Spaces marked with the car share sign are available to car share vehicles only, on a first-come-first-served basis. 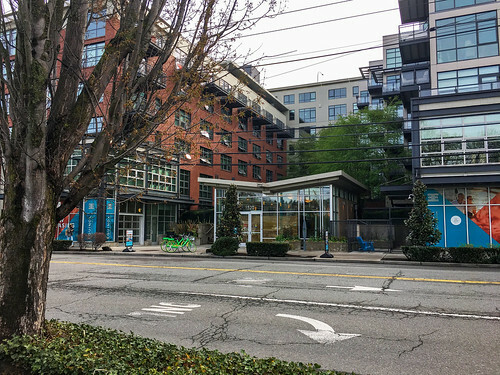 In Seattle, so far, that’s vehicles through ReachNow, car2go, or Zipcar (Note that if you’re using Zipcar you can’t end your rental at these spaces). Once you park, you can walk across the bridge for quick access to the UW Light Rail Station, the IMA, or Husky Stadium, and the UW campus is to the west! 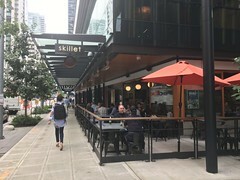 The Montlake location also features a 3-minute passenger load zone for easy drop-off and pick-up whether you’re in a private vehicle or a Lyft or Uber. 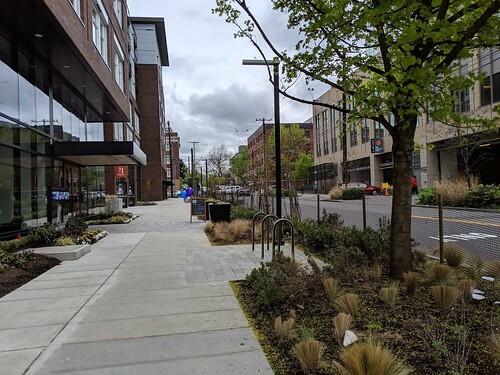 We don’t anticipate any traffic impacts with this change on Montlake; but if this is a location where you park a personal car, you’ll no longer be able to do that. 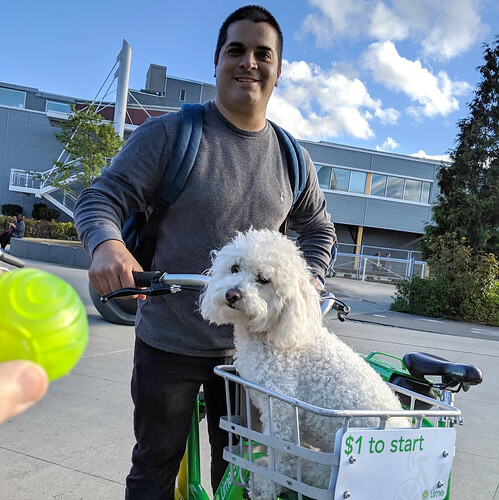 Seattle has both free-floating car-sharing, allowing drivers to park for free in most any legal parking space in the city (look for free-floating car share permit sticker in the windshield; currently, car2go and ReachNow), and some dedicated car share spaces, permitted for a specific operator (currently, Zipcar, car2go, and ReachNow). Places for spaces to connect. We support mobility options such as car sharing so that people don’t need to rely on personal vehicle ownership to get around the city! We’re starting to install dedicated car-share spaces in places that help people access transit and business districts. We’re currently evaluating other locations. Look for spaces soon near the West Seattle Junction! If you have ideas about potential car sharing locations, let us know! Car Sharing is a practice where people become members in an organization that owns a variety of cars, which members can then use under the terms of their membership. Car share permits are only available to approved companies. Visit our website, call 206.684.5086 or email us at trafficpermitsinfo@seattle.gov. Starting this Monday, August 20 fall. As the Washington State Department of Transportation plans for a full three-week closure as early as this fall, of SR 99 downtown – the Alaskan Way Viaduct – and the opening of a new SR 99 tunnel under downtown, we’re ramping up our strategy to deal with the traffic impacts in and around downtown. One key pillar of our plan for dealing with the traffic impacts is investing in transit and working to get 3rd Avenue to work as efficiently as possible. 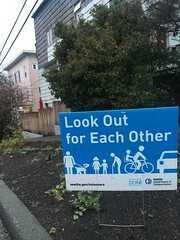 The Seattle Police Department will cite people violating new restrictions in the coming weeks, but in the beginning, you’ll see officers educating people driving. 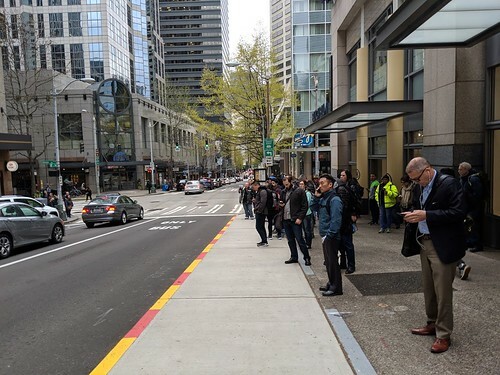 We’re working with King County Metro to bring transit improvements to 3rd Avenue – a street that carries more than 2,500 buses just about every day. On a normal weekday, these buses traveling up and down 3rd Avenue pick up and drop off 100,000 people. That’s the equivalent to 10x the number of people attending the Capitol Hill Block Party (which happened last weekend btw!). More people are choosing to ride the bus. It’s true! We’ve continued to see increased ridership over the last seven years, and 48 percent of Center City commuters take transit. In our quickly growing city, adjusting and prioritizing transit is going to be a key way to make sure people can keep moving reliably and affordably. So, in partnership with King County Metro, we’ll be making a number of changes to 3rd Avenue starting Monday, August 20 this September to keep pace with this demand for bus service to and through downtown Seattle. The plan for 3rd Avenue. Optimize bus service on 3rd Avenue by extending bus-only hours. 6 – 9 AM, Monday through Friday. 3 – 6:30 PM, Monday through Friday. The biggest change you’ll see starting Monday, August 20 in late September is 3rd Ave (from Stewart Street to just south of Yesler Way – see map) will be reserved for buses and people biking, from morning to night, 6 AM – 7 PM, seven days a week. People biking will still be allowed, as they are today. Cars will be allowed on 3rdAvenue, from 7 PM to 6 AM, seven days a week. No left turns off 3rdAvenue, 24/7. You can cross 3rdAvenue going east-west, 24/7. No on-street parking on Prefontaine Place, 6 AM – 7 PM, seven days a week. Permitted commercial vehicles will be allowed to use 3rdAvenue, from 9 AM – 3 PM and 7 PM – 6 AM, seven days a week. New ORCA card readers on 3rd Ave so you can pay before you ride. Currently, customers on RapidRide buses have the option of paying prior to boarding by tapping their ORCA card on a card reader at the bus stop. “Off-board” payment speeds up boarding and helps buses move more efficiently. Starting in March 2019, every stop on 3rd Avenue between Yesler Way and Denny Way will have an ORCA card reader and a real-time bus arrival sign. Construction is necessary to install the new ORCA card readers and will happen between November 2018 and March 2019 and will be back with more details as that work approaches. Improve bus traffic flow by moving and adding bus stops. Moving the southbound stop between Jefferson Street and James Street one block north between James Street and Cherry Street. Adding a new northbound stop between Columbia Street and Marion Street. Our goal is to have construction at these stops completed by March 2019 and March 2020, respectively, and we’ll share more information as that time comes. Have questions about these upcoming changes? 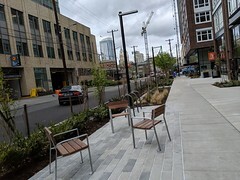 Connect with our project team, email us at ThirdAve.Transit@seattle.gov. Part of a bigger picture. These changes are part of a bigger set of strategies identified in the One Center City, Near-Term Action Plan. The One Center City Near-Term Action Plan identifies key projects and programs that will help keep people and the economy moving even as major construction projects and growth-related congestion reduce street capacity over the next three to five years. Working together, the City of Seattle, King County Metro, Sound Transit, and the Downtown Seattle Association (DSA), dedicated $30 million to fund near-term improvements that will ease pressure on downtown streets and contribute to great downtown places for people. To learn more about the near-term projects visit onecentercity.org. Revised blog from July 26, 2018. Progress on 23rd Ave Construction. 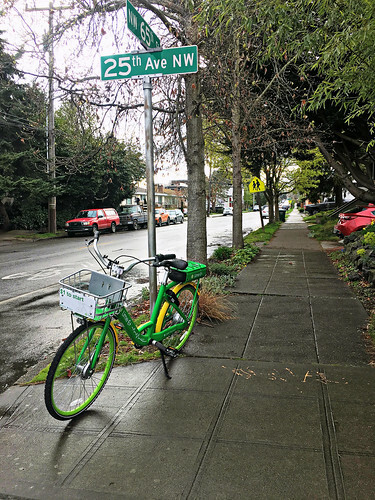 We’ve been busy rebuilding 23rd Ave S. and we’re close to wrapping up the west side concrete work on 23rd Ave S between S Jackson and S Norman streets. Coming up next in early August, we’re switching to the east side. Here’s what you can expect. West side concrete work is almost done! The contractor is making great progress and is almost done with the concrete work on the west side of 23rd Ave S between S Jackson St and S Norman St. You’ll notice new road and curbs have been poured on the west side of 23rd Ave S and we’re close to completing the sidewalks and curb ramps. The days of driveway closures are coming to an end! 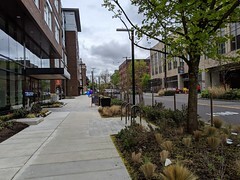 We still need to connect the new pavement to the existing side streets and do the planter strips, but the major concrete work on the west side of 23rd Ave S between S Jackson St and S Norman St is just about done – a major milestone for the project! SB detour will still be in place through the end of construction. East side work starting soon. We’re starting work on the east side of 23rd Ave S between S Jackson St and S Norman St in early August. The east side work is going to be more impactful than the west side work. In addition to building the new road, curbs, curb ramps, and sidewalks, we’ll also install a new water main underneath the street. All of this work is expected to last up to nine months. To make these improvements, east side neighbors will experience multiple temporary driveway, sidewalk, and side street closures. Like we did on the west side, we’ll provide advanced notice with details about when, and for how long, the closures will last. Seattle Public Utilities will also provide advanced notification for water shut-offs related to the water main installation. King County Metro buses will remain on the Martin Luther King Jr Way detour route. To safely do the work on the east side, we’ll be shifting northbound traffic onto the new pavement on the west side of the street. Don’t get too excited though, our southbound detour will still be in place through the end of construction. King County Metro buses will also remain on the Martin Luther King Jr Way detour route through the end of construction. Construction is expected to last through next spring. Clearly, we’re moving into the dog days of summer and construction. The good news is that time flies, and before you know it, you’ll be skiing and snowboarding again, and we’ll be counting down the days to the end of construction. So please hang in there and thanks for your patience! We’ve been coordinating with the Vulcan project happening on the southeast corner of the 23rd Ave S and S Jackson St intersection to minimize construction impacts. They’ll be taking advantage of our street closure to do some work in the street along 23rd Ave S. This work will be happening over the next few weeks, including some weekend work. If you have questions while their work is happening, please contact them at 206.453.1005. Also, please visit their website for their latest construction update. Work has started to ramp up along 23rd Ave S between S Judkins St and Rainier Ave S. Crews have been installing new storm drains, trenching in new conduit, and building new sidewalks and curb ramps. In the next few weeks, work will increase in the Rainier Ave S intersection. As the work picks up, please expect to see more traffic control, pedestrian detours, lane restrictions, and some weekend and nighttime work. The outreach team will notify impacted residences, businesses, and pedestrians prior to any major impacts. Businesses will be open during this work. Please continue to support them during construction. For more info about the 23rd Ave Corridor Improvements, visit our website, email us at 23rdAveCorridor@seattle.gov or call the project info line at 206.727.8857. Here’s what’s new or changed since our Monday This Week post. FRI 7.13 → MON 7.16 | The next big #ReviveI5 (NB I-5) closure runs from tomorrow at 8 PM through Monday at 5 AM–it’s a good time for a zen mindset. All NB I-5 lanes from W Seattle Bridge off-ramp to Seneca St will be closed. Check out our alternate routes map here. SAT 7.14 & SUN 7.15 | Weather permitting, paving crews will resurface a section of NE 42nd St, plus the east leg of Latona Ave NE from NE 42nd St to about 4313 Latona Ave NE. That section of Latona will be closed will be closed 8 AM – 5 PM each day; NE 42nd St will be down to one lane in the area; and NE 43rd St between Thackeray Pl NE and 4th Ave NE will be closed to through-traffic. THURS 7.12 → NOV 2018 | Starting today and M-F until November, the NB right lane of Greenwood Ave N will be closed from 8 AM to 3 PM, to protect the safety of crews working on a new sidewalk, planting strip, curb and gutter. The lane closure starts at 137th St, extending to 145th St as work progresses. WED 7.18 | Boren Ave between Howell and Olive will fully open next Wednesday at 5 AM. 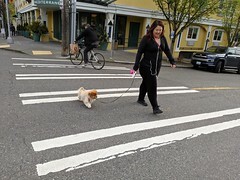 The street segment has has a SB lane closure since April 2018. MON 7.23 | The Columbia 2-way project is now expected to be complete on July 23, 1 week later than anticipated. 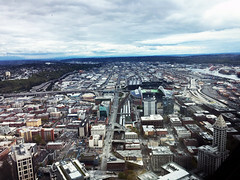 Email us at construction.coordination@seattle.gov or call 206-684-ROAD.